Cemex USA announced it has received the 2019 EPA Energy Star Partner of the Year Award for its outstanding efforts in energy management, highlighting the company's longstanding commitment to sustainability. Loesche America is a subsidiary company of Loesche GmbH. The company currently offers vertical roller mills (VRM) as well as innovative engineering solutions for various types of dry grinding and processing of cement, coal, minerals and other raw materials. The size of projects can vary from mill supply plus basic engineering to complete plant supply or even turn-key solutions. LTB America is a full-service environmental engineering firm focused on the design, manufacture and installation of various types of air pollution control technologies for a wide range of industries. The team at LTB America analyzes the situation on-site to be sure that they provide the most cost-effective total solution to satisfy its customers’ needs for air pollution control. M.L. Smith, Jr., LLC, operates nationwide constructing tanks and refractories. Its competitive edge is its dual capability of providing both refractory construction and steel fabrication/erection. The company provides customers a true turnkey package of steelwork and refractory tearout/replacement for kilns, coolers, firing hoods, ductwork, hoppers, silos, and other platework for cement and lime plants. Magneco/Metrel is a privately owned manufacturer of specialty refractory monolithics that provide exceptional value and optimize availability for ironmaking, steelmaking, ferrous and non-ferrous metallurgical and glass manufacturing applications. Metpump products are 100 percent bonded refractory with no joints. The system is delivered in two components: Metpump dry powder and Metset liquid binder. Metco Environmental, an affiliate company of TestAmerica Analytical Testing Corp., conducts source testing and air quality studies. As one of the largest companies in the U. S. specializing in source emissions testing, Metco has served a full spectrum of industries, which include refining and combustion. A dedicated report preparation department is staffed and equipped to generate final reports within 21 days of completing field work for most projects. MKS Instruments is a global provider of instruments, subsystems and process control solutions that measure, control, power, monitor and analyze critical parameters of advanced manufacturing processes to improve process performance and productivity. Products are derived from the company’s core competencies in pressure measurement and control, materials delivery, and vacuum technology, among other areas. NatronX provides innovative dry sorbent injection solutions and products that efficiently reduce air pollution (SO2, SO3, HCl, HF, Mercury) in coal-fired power plants, waste incinerators, industrial boilers and other industries, while reducing the significant capital investment required by environmental regulations. It’s a supplier of EnProve, a line of sodium alkali sorbents as well as powerful DSI technology solutions that combine to efficiently remove harmful stack gases. In business for more than 100 years, Nordstrong Equipment prides itself as an industry leader in the design and manufacture of superior bulk material handling equipment. In addition to custom-designed and -built conveyor systems, the company also designs and manufactures a line of hoisting equipment for dump body applications under the Nordic trade name in the Hydraulics Division. Cabot Norit Activated Carbon is the world’s largest and most experienced producer of activated carbon. In July 2012, Norit was acquired by Cabot Corp., a leading global specialty chemicals and performance materials company. Products are used to remove pollutants, contaminants and other impurities from water and air, and other liquids and gases in an efficient and cost-effective manner. Since 1969, Orbital Engineering has successfully provided engineering, risk mitigation, and project delivery services. Its engineering experience includes unique solutions in bulk material handling, materials processing, environmental compliance, and process automation. Past projects have included a cement plant stormwater management and treatment system and a dust collection system installation. PANalytical has a strong track record in meeting the specific needs of the global building materials sector. Its position of leadership has been earned by a unique approach – providing complete analytical solutions for specific applications according to relevant industry norms. PANalytical aims to provide turnkey solutions that provide high-quality data and practical benefits. PENTA is a full-service engineering and construction management company, providing engineering from concept to final installation, maintenance services and engineered corrosion resistant coatings for gas handling equipment. PENTA has provided support to several cement clients with NESHAP regulations by assisting them in selecting the most cost-effective solutions, preparing conceptual layouts and capital cost estimates, and participating in their implementation. Plattco specializes in the design and manufacture of double flap airlock valves and associated multi-purpose slide gates to solve solid material handling problems in a variety of applications in cement plants throughout the world. Benefits to these products include: A reliable, long-lasting seal; a seal that is easy and inexpensive to maintain; a valve that has been custom engineered; and an aftersale support system. Pneumat has successfully solved complex flow problems for many clients in the cement industry with its Cardox, BinWhip and OnSite Cleanout Crew Service. 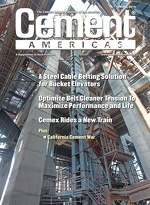 Pneumat is the only American manufacturer of Cardox, which with one “blast” can clear blockages, plugs and chokes in pre-heater towers, silos, kilns and more. Polysius has worked with all of the major global cement producers, as well as the majority of the independent companies located within the U.S. and Canada. From retrofits to complete clinker production lines, from homogenizing to raw grinding utilizing no less than three different machine types, from clinker generation to finish grinding and everything in between, Polysius is a one source for equipment, engineering and services. With more than 25 years of experience, Process Solutions integrates proven technologies with cement industry specific software to provide systems for shipping automation, production quality management, and advanced control. Process Solutions has quietly become the leading supplier of cement shipping systems in North America, and a leading supplier of Laboratory LIMS as well as raw mix control systems throughout the world. Promecon manufactures and installs high technology measurement systems for the monitoring and optimization of thermal processes. Typical Promecon projects in cement production: Analysis of the raw mill mass-energy balance; measurement of Tertiary Air; gas balance through the grate cooler; gas balance through the kiln preheater; and complete engineering solution, including project management. Redecam Group provides filtration equipment, gas treatments systems, upgrade, and turnkey services in the cement industry. The company’s products include large-volume and high-dust-burden bag-filters; low- and medium-volume modular bagfilters; special bag-filters for coal mills and silos; air/air heat exchangers and process exhausts; gas conditioning and reaction towers; and standard and tailor-made screw conveyors and air locks. REFKO Refractories US was founded in January 2013 to provide the special products and excellent service of REFKO Feuerfest GmbH close to the customer. The REFKO product range covers all types of monolithic refractories as well as prefabricated refractory shapes. In recent years, REFKO has increasingly engaged in the engineering, construction and management of full refractory lining turnkey installations. ALFRAN has been a long time supplier to the cement industry. In 2000, the company introduced Alfranjet, which reduces the duration of the maintenance works and the amount of refractory wasted, providing higher availability to the plant and overall lower refractory costs. With the Alfranjet System, high-application efficiencies (3-5 m3/h) are achieved, resulting in a reduction in a shutdown time for the plant. Rexnord is a leading industrial company that serves a diverse array of growing, global end markets with the broadest, most reliable product portfolios and trusted brands in its industries. Shurlok adapter mounted roller bearing and Marbett conveying components are designed to maximize uptime and minimize changeover time. In addition, minimal lubrication requirements and enhanced all-around efficiency mean reduced downtime. With expertise in nearly all aspects of cement plant and facility design, River Consulting can successfully integrate services from technology OEMs and construction partners to deliver hundreds of reliable solutions that contribute to each client’s success. From processing and grinding raw materials and finished product, to storage, conveying, loading, receiving, shipping, and packing, River Consulting delivers complete project services. As a well-known partner to the cement industry, Scheuch provides technically advanced dust collection equipment for the following areas: wet and dry rotary kilns; Chlorine/Alkali-bypass; clinker cooler including cooling systems; mills, classifiers, dryers; coal milling dryers; and silos, conveyor systems, packing systems and loading systems. Sentry Equipment can sample cement from chutes and gravity/freefall, air slides, conveyor belts, and pneumatic convey lines. The Model RX sampler takes a strip sample of free-flowing materials from drop chutes, bins, hoppers, etc. Model B1 Automatic Sampler for Bulk Solids is a low profile auger sampler designed to handle free-flowing and non-free flowing materials from gravity lines and hoppers. Founded in 1968, Service Wire has grown into a leading manufacturer and distributor of industrial grade wire and related products. Its three factory warehouses maintain large inventories and complete cutting capabilities, which allow for same-day shipment and 24-hour emergency service. This approach makes the company a prime supplier to industrial, commercial, utility, pump and irrigation and transit markets. SICK Process Automation supplies innovative analyzers and measuring devices for gases, gas flow, dust and process liquids configured to meet application needs. SICK’s DustHunter SP100 dust monitor is ideal for thick-walled or double-walled ducts because of the one-sided installation. For gas sampling there’s the SCP3000 sampling system, and the MCS100E HW analyzing system for gas analysis. Siemens has the motors, drives, gearboxes, and couplings to serve the complete power conversion spectrum, driving both energy efficiency and productivity improvements. Innovative motion control technologies decrease time-to-market and increase overall productivity and reliability. The company provides value-added services such as mechatronic support and online services for web-based reventive maintenance. Spectrum Systems is a provider of information technology products, enterprise software suites, platform solutions, and customer support for the federal and commercial markets to help their organizations succeed. It offers expert consulting and service practices in design, testing and implementation specifically focused on data, information, applications, and enterprise platform management. TECO-Westinghouse is a world leader in manufacturing electric motors and generators, with a broad selection ranging from ¼ hp to 100,000 hp. It’s also a leader in supplying motor controls, and providing engineering services, genuine Westinghouse renewal parts and large motor repairs. The company’s products are used to drive pumps, fans, compressors, rolling mills, grinders, crushers, and a variety of other rugged applications. Tecnetics Industries is a leading designer and manufacturer of in-motion weighing and metering products for dry material handling applications in the mining, construction aggregates, food, chemical and plastics industries. Marketed under the Tecweigh brand name, products include: belt scales, volumetric and gravimetric feeders, weigh belt feeders, control gates, processors, and custom engineered systems. Teledyne Monitor Labs is a leading supplier of environmental monitoring instrumentation for the detection, measurement, and reporting of air pollutants. The company has over 40 years’ experience in providing state-of-the-art Continuous Emissions Monitoring products to a wide variety of industrial markets. Products include flow, gas, particulate and opacity monitors. Thermo Fisher Scientific provides analytical spectroscopy, online elemental analysis and emissions monitoring instrumentation. The company is a single-source provider for tested and proven products like the Mercury Freedom System and the Model 43i and 42i series of analyzers to monitor SO2 and NOx, respectively, to help meet regulatory requirements. Thermoteknix has been an active player in the global cement manufacturing market for over 25 years, providing systems to improve plant performance, assure quality whilst saving money. These high-quality systems regularly include new and innovative ways of working and continue to lead the market. For instance, the ThermaScope SLK is a high-temperature radiometric kiln and cooler camera with real-time imaging for improved efficiency, increased combustion control and lower pollution. Thorwesten Vent GmbH is an internationally recognized specialized company for constructional explosion protection and the manufacturer of self-reclosing, internationally patented explosion doors. The company offers explosion protection-related consultancy for both the planning of new and the correction of existing grinding facilities for solid fuels, and supplies pressure shock resistant silos for solid fuels. TMEIC Corp. designs, develops and engineers advanced automation, large AC machines and variable frequency drive systems. The company specializes in metals, material handling, oil & gas, mining, testing and other industrial markets worldwide. Since 1999, Trinity Services has provided top quality CEM servicing tailored to customers’ needs. From routine preventive maintenance to 24-hour emergency response, Trinity offers a broad spectrum of services to ensure compliance with federal and state regulations throughout the country, including: routine CEM maintenance, Relative Accuracy Test Audits (RATA), field service support, and CEM Consultation. Tube City IMS offers a full range of services to support every phase of steel production processes anywhere in the world. On-site facilities range from specialized services at a single site to large, dedicated operations providing a complete array of services such as slag handling, surface conditioning and slag aggregates. TurboSonic is a global supplier of air pollution control and liquid atomization technologies. SoniCool provides accurate temperature and humidity control to condition flue gases and particulate. The SoniCool system enhances collection efficiency and reliability of air pollution control systems. Production can be increased with lower gas temperatures, which results in reduced gas volumes. Unicast designs and distributes high-quality cast replacement wear parts for the cement, mining, and aggregate industries worldwide. Core products include diverter valves, apron feeder pans, drag chains, hammers and blow bars, mill liners, grizzly panels, cooler grates, and OEM castings. Unicast designs wear parts to optimize production efficiency and maximize cost-savings. Unitherm Cemcon, a private owned company located in Austria, provides the cement industry with M.A.S. kiln burners, burner accessories and fuel supply systems. M.A.S. burner systems are tailor made solutions combining the company’s well-proven standard technique with solutions to meet the customers’ kiln requirements. Since 1984, Van Dyk Recycling Solutions has offered world class solutions for the recycling and sorting of residential and commercial single stream, paper, plastics, E-Waste and Municipal Solid Waste. It has led the North American market by building over 1,780 efficiently operating and profitable plants. The company partners with customers to offer innovative solutions that deliver the lowest processing cost per ton. In addition to industrial fans, Venti Oelde’s manufacturing program includes dust collection and process gas cleaning plants, exhaust air treatment plants, ventilating, heating and air-conditioning plants, recycling and waste treatment plants as well as plants for surface technology. Maintenance, servicing, inspection, repairs as well as plant upgrading, rationalization and enlargement complete the available services. VIM Technologies is a leading supplier of Continuous Emission Monitoring Software Solutions, and associated Compliance Support Services. The Compliance Optimization & Monitor Performance Accuracy Service (COMPAS) program evaluates the condition of reportable air compliance data and the suitability of the user’s monitoring plan and certification data against a data validation model prior to submittal. Gore focuses its efforts in four main areas – electronics, fabrics, industrial and medical products – in an array of industries. Along with Gore fabric filtration capabilities, the Shanghai Bag Filtration Equipment Company (SBFEC) facility also produces a variety of parts for baghouses, including cages, venturis, pulse valves and more. Wear-Concepts is a specialty supplier, designer, and installer of wear- and abrasion-resistant products. With nearly 75 years combined service in the cement industry, Wear-Concepts offers solutions to some of the toughest wear problems in conveying systems, clinker handling systems, crushing operations, and pipelines. Wear-Con provides turnkey installations with MSHA Part 46 certified field crews. Webster provides engineered conveying solutions for a wide range of industries. For the cement industry, the company provides hardened steel bushed (HSB) chains, steel bushed roller (SBR) chains, combination chains, heavy-duty welded steel clinker chain, apron conveyors, cast steel buckets, fabricated steel buckets, as well as many other made-to-order, custom-designed conveyor chains. WEG is the largest industrial electric motor manufacturer in the Americas, and one of the largest manufacturers of electric motors in the world producing more than 10 million units annually. The company offers a diverse and integrated product line that includes motors, drives, soft starters, controls, panels, transformers, generators and custom solutions. Founded in 1966, Welding Alloys Group is the global specialist in low and high alloyed cored wires, automated welding equipment for surfacing and joining applications, and industrial welding applications through Integra Service Centers. The company, through its worldwide presence and application expertise, has become the world's largest service company for grinding mills. Since its establishment in 1917, The Yokohama Rubber Co. (YRC) has introduced numerous products including tires and industrial products. YRC conveyor belts are available in a broad range of specifications relating to cover compound, carcass and structure.